In a few days I will be embarking on my leg of the major NERC project called ORCHESTRA (Ocean Regulation of Climate through Heat and Carbon Sequestration and Transport) to collect seawater samples for isotope analysis. 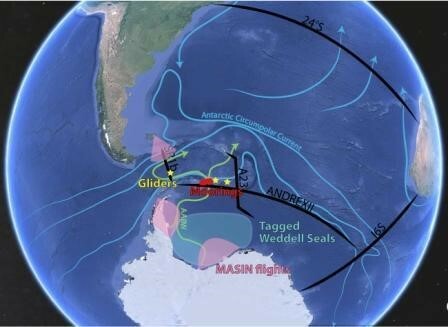 My leg is called ANDREX II - Antarctic Deep Water Rates of Export (ANDREX), and is the second time this part of the ocean has been sampled. I will be boarding the RRS James Clark Ross in Punta Arenas and following a stop off in the Falklands will start sampling from the tip of the Antarctic Peninsula along the 60°S parallel and across the Southern Ocean to 30°E, before returning to the Falklands in mid April. Since the industrial revolution, the global ocean has absorbed around 30% of anthropogenic (human-produced) CO2 emissions. In addition, 93% of the total extra heat in the Earth system since the onset of global warming has been absorbed by the global ocean. Improving climate prediction requires us to learn more about how the global ocean works, and how it interacts with the atmosphere to control the split of heat and carbon between them, especially given the extra heat and carbon we are currently producing. The ANDREX leg in particular seeks to assess the role of the Weddell gyre in driving the southern closure of the meridional overturning circulation, in ventilating the deep global ocean, and in sequestering carbon and nutrients in the global ocean abyss. ORCHESTRA is in the second year of a five year collection programme around the World’s oceans. I will be collecting samples from the RRS James Clark Ross. I will be tweeting @CarolArrowsmith and @ORCHESTRAPROJ and Facebooking (Orchestra project) along the way, as well as updating the BGS Geoblogy. Carol Arrowsmith is a chief technician in the stable isotope facility at the BGS. ORCHESTRA (Ocean Regulation of Climate by Heat and Carbon Sequestration and Transports) is a programme funded by NERC and includes partners at the British Antarctic Survey (lead), the National Oceanography Centre, Plymouth Marine Laboratory, and many more including BGS. With only 11 years to go until the first UK emissions target deadline, the race is now on for the UK to reduce its greenhouse gas emissions by 57% by 2030 of 1990 levels. BGS geoscientists, David Boon and Gareth Farr ask ‘How on earth will we do it?’. heat pumps in district heat networks. In our first blog titled 'How to Heat a City', we announced our intention to install a pilot open loop Groundwater Source Heat Pump (GWHP), as part of an InnovateUK funded feasibility study to better understand how UK shallow aquifers can supply low carbon heating in urban areas. The recently established Cardiff Urban Geo Observatory hosts the GWHP pilot, which is conveniently surrounded by a world class groundwater monitoring network with over 100 temperature sensors in 60 boreholes, providing high resolution baseline data. Groundwater in urban areas can be slightly warmer than rural areas, due to the ‘subsurface Urban Heat Island effect’, and this human footprint actually makes heat pumps run more efficiently. The pilot GWHP scheme is a collaboration between WDS Green Energy, City of Cardiff Council and the British Geological Survey. 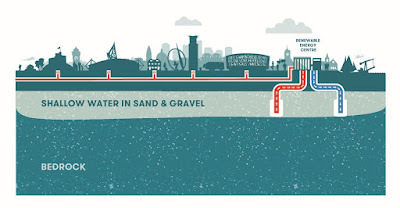 The physical infrastructure comprises two shallow boreholes (~20 m deep) that abstract and simultaneously re-inject shallow groundwater from an ice-age sand and gravel aquifer which underlies much of the city. The heat pump system works by passing groundwater through a heat exchanger where 2 Kelvin degrees of its thermal energy is transferred to a heat pump which uses a gas phase-change to raise the water temperature to a useable 46oC. The heat pump keeps the inside of the school at a comfortable 22oC using a renewable energy resource that has low carbon emissions and is cheaper to run than the old gas boilers. As part of the InnovateUK project we fully instrumented the heat pump system with sensors above and below ground to allow us to follow its long-term environmental impact and energy performance. The project proved this technology could be scaled-up across Cardiff and other UK cities with similar shallow aquifers, where the geology allows. Shallow aquifers can be a super-efficient way to run a heat pump as the borehole pumps do not require much energy to lift the water compared with deeper schemes. The energy efficiency of our pilot GSHP system is around 450 %, over four times more efficient than a condensing gas boiler, and is actually saving the council money on its energy bills! And what about that all important CO2 target? 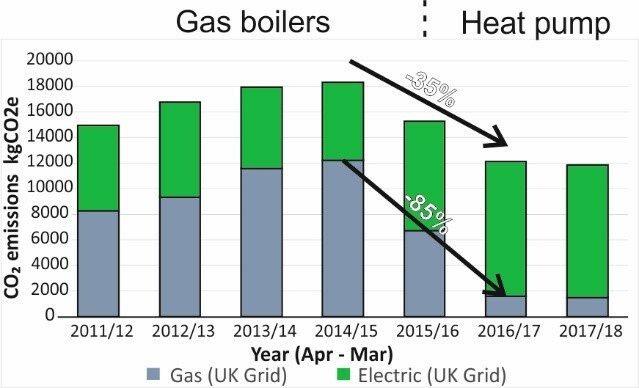 …well after 3 years' the pilot GWHP had reduced the cost of heating with a 35 % reduction in CO2 emissions from the school overall. The project has also had impact on energy policy in Welsh Government and was featured as a case study in a recent National Assembly for Wales Low Carbon Heat Research Briefing. The Cardiff Urban Geo-Observatory, which includes the heat pump monitoring pilot, has also been selected along with the Glasgow UKGEOS site as a pilot area for a new 3-year EU GeoERA project called MUSE (Managing Urban Shallow Geothermal Energy), and as a European Plate Observing System (EPOS) site. shallow groundwater source heat pump. Data courtesy of Cardiff City Council. We will continue to monitor the environmental impact of the scheme on the aquifer source, and the BGS Geothermal Team is keen to support other UK cities in their journey to explore their range of geothermal resources. The project has also attracted lots of interest from industry keeping the project’s Principal Investigator, David Boon, busy giving presentations to stakeholders such as the IEA Heat Pump Technologies Annex 52 meeting in London in September 2018, seminars for Construction Excellence Wales and APSE Energy. The research findings will feature in a new CIBSE Code Of Practice (CP3) and in peer-reviewed papers. 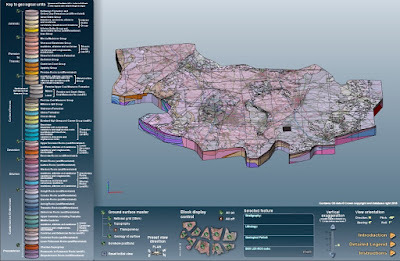 Although open-loop ground source heat exchangers are not suitable in all geological environments, we have been working to understand the wider 3D geological and hydrogeological settings at a city-scale, with the release of a 3D superficial geology model of Cardiff. This evidence will allow better ‘above’ and ‘below-ground’ planning and regulation, and will (we hope) stimulate market growth in renewable energy systems and supply chains. More demonstration projects like this are needed to improve the image and public perception of renewables. Local authorities can invest in renewable energy such as heat pumps using interest-free Government-backed finance schemes like the SALIX finance and the Renewable Heat Incentive (RHI) scheme. Case studies such as ours can give society and business the confidence to invest in shallow geothermal technologies to accelerate the energy transition. Integration of geochemistry and sedimentology is vital to understanding ancient sedimentary deposits as hydrocarbon, metal or aggregate resources, and as records of climate change and carbon burial. For this reason we convened sessions focussed on this topic at the BSRG AGM recently hosted by the Lyell Centre in Edinburgh. 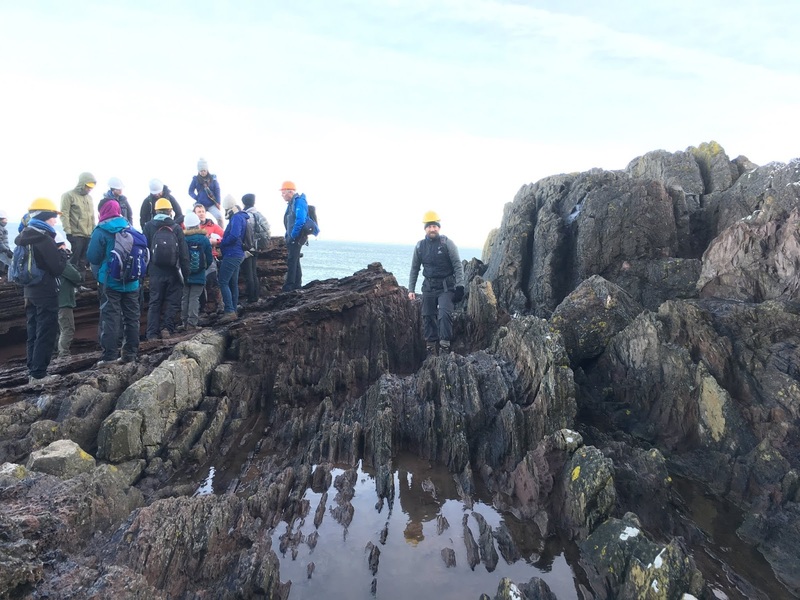 BSRG this year involved around 300 delegates from across the UK and overseas presenting and discussing ongoing research in sedimentology and related fields. About a third of the conference focussed on understanding modern sedimentary processes in a variety of settings, including continental, nearshore and shallow through to deepwater settings. This is based on the principal of uniformitarianism; that ‘the present is the key to the past’. If we better understand modern sedimentary processes, this knowledge is then applied to ancient deposits for a variety of purposes. For example, experimental sedimentology using flume tanks or live monitoring of sediment density flows, can help us better understand reservoir variability, a critical parameter for oil and gas extraction or carbon capture and storage (CCS). 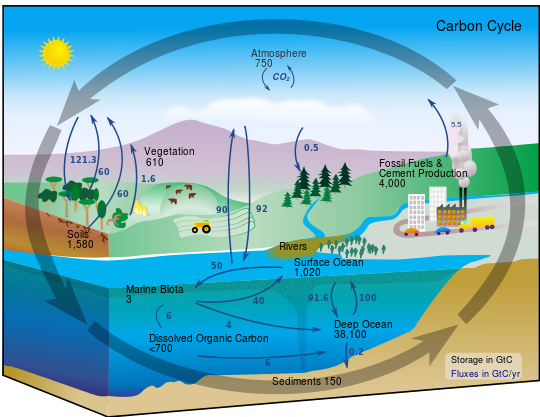 Geochemical research on sedimentary rocks is typically used to understand hydrocarbon reservoir and source potential. Yet this research is not limited to oil and gas research, and is increasingly applicable to a wide range of areas. For example, geochemistry used to understand mechanisms and timing of sandstone diagenesis is important for CCS. Hydrocarbon source rocks, often termed ‘black shales’, are enriched in redox-sensitive metals which can become mobilised and concentrated, as part of mineral systems, to produce important metal deposits. Black shales are the record of ancient basin sinks of large volumes of organic carbon and metals fixed under anoxic conditions. Topics at BSRG included understanding the genesis of stratiform manganese deposits in Cyprus, and focus on the models for anoxia in a variety of ancient settings. Black shale research also helps understand the impacts of global warming on modern marine systems. Modern anoxic settings, such as the Black Sea, are rare and spatially limited compared to some periods in the ancient record. Yet it is highly likely global warming is causing the expansion of modern marine hypoxic ‘dead zone’ phenomena. Therefore ancient anoxic ‘events’ are potential analogues to ‘dead zones’. In this respect, this is the principal of uniformitarianism but in reverse. Through this research we can better understand timings, spatial extents and impacts of these anoxic events. BSRG also hosted for the first time a special session bridging the gap between sedimentology and society. The session included presentations on microplastics in the natural environment, sedimentary geohazards and energy storage in sedimentary reservoirs. Many of these applied research areas are likely to become increasingly important if we want realise our global decarbonisation targets as set out in the IPCC Special Report on Global Warming of 1.5°C. Taken as a whole, the 2018 BSRG AGM shows the importance of sedimentology to a wide range of current and future applications, including energy, metal resources, construction, understanding and mitigating climate change, and ultimately society. Observations are the root of scientific knowledge. Because we can observe distant galaxies in the vast expanse of space, we also can learn about the laws that control our universe and uncover our solar system’s fourteen billion year history. Perhaps the relationship between seeing and knowing is too obvious to be particularly striking. But turning the premise on its head leads to some interesting questions; What do we know about things we cannot see? What can we know about things that are beyond our capacity to observe? It is easy to shrug our shoulders and assume that things we can’t see don’t matter. But what if it is important that what is out of sight is not also out of mind? What the ground is made of has far reaching impacts, stretching well beyond giving us a place to stand (and build). The Earth supplies much of our energy, all our resources of metal, aggregates, and stone, a lot of our salt and water, and (apart from the space junk we leave floating in orbit) it must also store all our material waste. Society is not only built on the earth, it is built from it. So we all have a stake in our planet. For many decades, conversations about rocks, sediments and landscapes used to be held largely in the relatively ‘niche’ domains of science and industry. Now, our search for energy, and decisions about how we manage our environment and resources are increasingly matters of public debate. Geology matters to us all. As the British Geological Survey, our role is to ‘shine a light’ into the subsurface – using a range of tools for investigating what is hidden below ground. This helps us deliver targeted insights to support industry, regulators and planners, but it doesn’t stop there. We also deliver open access resources designed to provide everyone and anyone with the opportunity to see into the subsurface, to learn more about what is down there, and how we know. 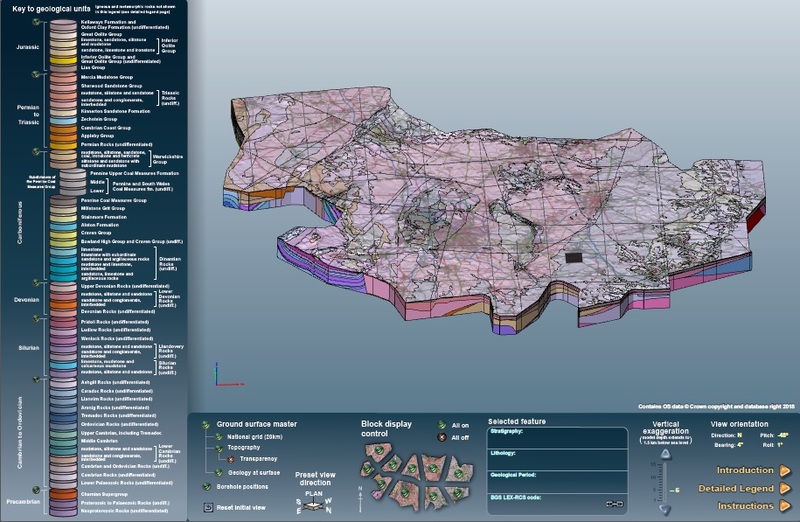 With the digital revolution in geoscience, 3D geological models are now offering enhanced visualisation of the subsurface – literally allowing us to see into the ground. This mysterious hidden domain that was once largely conceptualised within the minds of geologists, and depicted in codified form on geological maps, is at last being opened up and revealed to everyone. 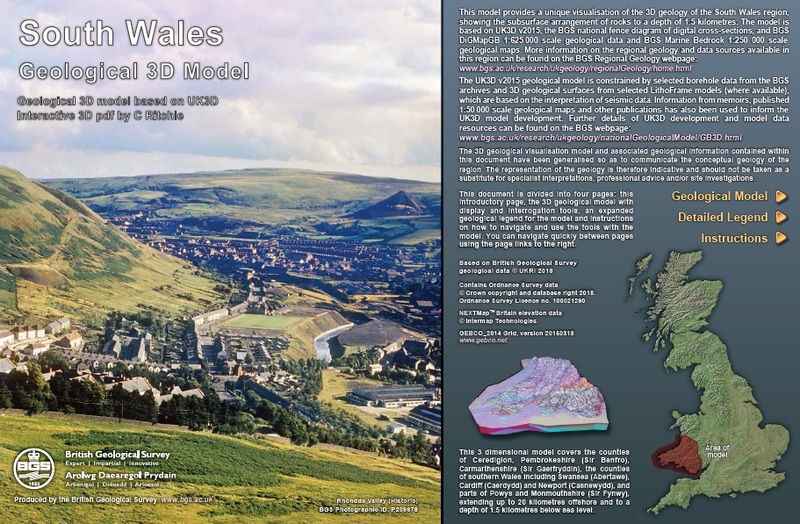 Marking a new stage in our delivery of open access resources for the UK, BGS have now launched a new set of 14 Regional Geological Visualisation Models, developed as 3D pdf ‘documents’ and available from the BGS website. The models, initially covering England, Wales and Northern Ireland (with models for Scotland planned), reveal the 3D geology of the UK by linking the UK3D national fence diagram of cross-sections with 1:625 000 bedrock geological maps. A range of interactive tools have been designed to allow users to navigate and explore, revealing the hidden structure of the world beneath us. So this is an invitation to take a look, to learn about your world, to see the places you know from a new angle. Shakespeare wrote that “all the world’s a stage” – to really know this ‘set’ in which we go about our lives, to understand the myriad of relationships that are part of our story, we first need to be able to see the Earth. So get stuck in… and when you do take look at the models – tell us how you find them, and help us see our way to making the world beneath our feet more visible. Twenty years in the making, the Unified BARGE Method (UBM) of measuring bioaccessibility has become a British and International Standard method used to improve estimates of the risks from ingesting contaminated soil. As a geological survey, we are interested in the details of soil chemistry and how that affects people’s health. It’s not just about measuring the total concentration of elements, but more about estimating risks from contaminant absorption into the bloodstream. 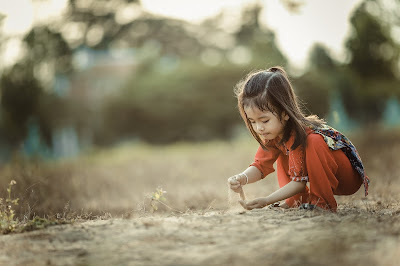 Children regularly eat soil, usually accidentally but in some cases deliberately. This soil can contain important nutrients, but also contamination. Ingestion can happen by licking fingers after playing in the garden, rubbing faces with soily hands and making ‘mud pies’. Human exposure to soil contaminants may be damaging health. 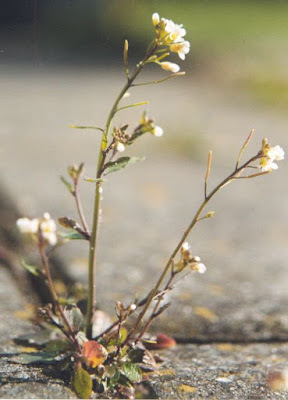 It is therefore important that we know how much soil we ingest, the amount of contamination within it, and the mineralogy so that we can better assess the risks of activities such as leisure use of parks and gardens or to support regeneration of post-industrial brownfields in our cities. Any soil contaminant that dissolves in the gastro-intestinal juices is termed ‘bioaccessible’. 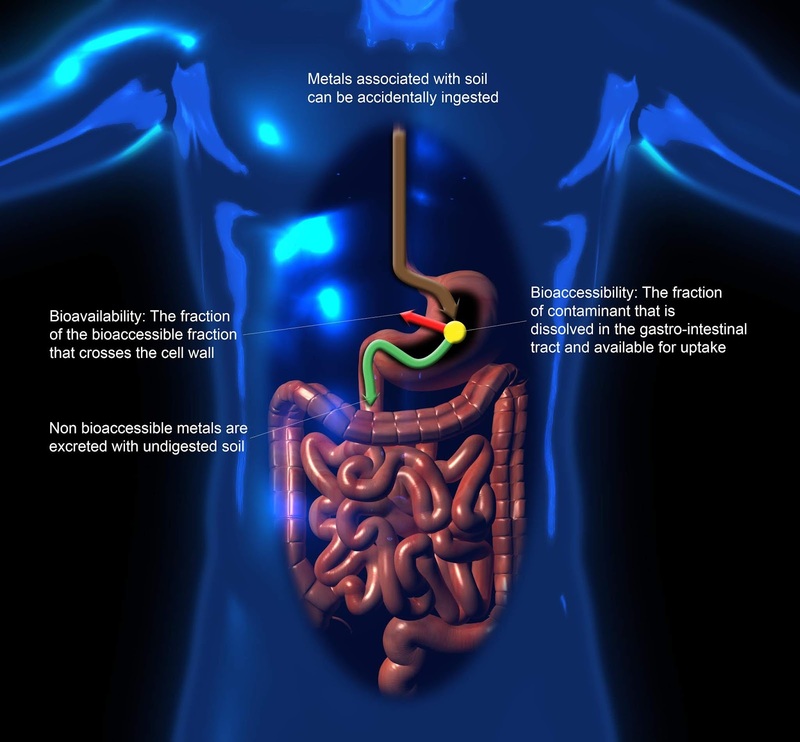 If dissolved contaminant is transferred through the gastro-intestinal wall and into the blood, it is ‘bioavailable’ and has the potential to reach organs where it can cause harm. Any remaining bioaccessible contaminant and undigested soil is excreted. The Northampton Sand Formation as naturally high concentrations of arsenic. However our research at several proposed housing sites showed that only a small fraction would dissolve in the stomach juices and potentially pass into the bloodstream. This helped risk assessors from Land Quality Management Ltd demonstrate to the local authority that remediation was not needed before safe development of the land for much needed homes. The longer-term legacy of our industrial past is now becoming evident. Some contaminants can still be detected at potentially toxic levels decades after they were first released. We have shown that bioaccessibility studies on soils and made ground at post-industrial brownfields can improve decisions on future land uses. We can measure the bioaccessible fraction of soil contaminants by simulating the chemical and physical conditions found in the human gastro-intestinal system, e.g. the composition of fluids, body temperature and the amount of time solids stay in the gut. For the last 20 years, staff at BGS and our industrial and international research partners, have been developing a robust laboratory based method for the correct estimation of bioaccessibility. Such estimates provide defensible information for use in risk assessment and policymaking. The BGS is part of BioAccessibilty Research Group of Europe (BARGE). BARGE started as a small network of European research teams, comparing methods for a range of soils. We have now expanded to 20 researchers, with groups from Canada and America and we are looking forward to more joining us. Perhaps we should change our name from Europe to ‘Everywhere’! Back in 2005, BARGE decided to use a single method with agreed gastrointestinal parameters, for measuring bioaccessibility; the Unified BARGE Method was born. We worked together on a pooled set of samples from various countries with different concentrations of potential toxic elements: arsenic, lead and cadmium. The results of a round robin trial were compared and the group explored the whats and whys for any difference in the data. Then there was the question of validation: 'How well does our in vitro test compare with in vivo analogues?' Colleagues in France at the University of Lorraine and the French National Institute for Industrial Environment and Risks (INERIS) vivo-vitro validated the UBM measurements using a pig analogue, resulting in a paper in the high-impact journal Environmental Science and Technology (Denys et al., 2012). The UBM has now been used and cited internationally by a range of science disciplines, including environmental, soil, toxicology, public health, pharmacology and medical sectors and helped inform many risk assessments. In 2007, the International Standards Organisation published guidance on the application and selection of physiologically based extraction methods to estimate the human bioaccessibility/bioavailability of metals in soil. In 2018, BARGE’s hard work paid off when a new standard was introduced: BS ISO 17924:2018 specified the UBM as the method to use. From the start of the journey through to the publication of the ISO standard, the BARGE group and researchers around the world have published over 30 peer reviewed papers and articles for non-specialists and given oral and poster presentations at too many conferences for us to remember. The UBM has been used by researchers and commercial laboratories alike for assessing the human health risk from contaminants in soil, herbal medicines, changing land use, dust, air particulates, mine waste and food. It has been coupled with other laboratory based methods to understand why a contaminant is soluble in the gastro-intestinal environment, not just how much is available to do harm. Bioaccessibility information can be used by environment & health professionals, amongst others, to make better informed decisions on the need for remediation (and its success), land redevelopment and planning applications, and to potentially reduce the cost associated with returning brownfield sites to beneficial use. In 2009, NERC funded a study on the financial impacts of bioaccessibility testing. It showed the savings achieved by using it at potentially contaminated sites. The results are given in the table. Similar savings will have been made at an increasing number of contaminated sites since the study reported. More recently, bioaccessibility data has been used to predict bioaccessibility of contaminants on a regional scale. The map uses UBM data and geochemical survey data on soils to predict the bioaccessibility of arsenic in the soils of south west England. Please visit the BARGE website for a flavour of what has been done by the group, and who is involved. Be prepared for some photos of when we all looked a lot younger. The development, validation and now publication of an ISO standard is an important scientific milestone. But sometimes, when you are in the thick of it, you don’t realise how many people and how long it takes to go from inception to completion. Don’t forget to have a look at BS ISO 17924:2018 via our library.